Many of the world's top poker players are currently en route to London for the start of the EPT London, which officially kicks off on October 2nd. Europe is the focus in October, as you have major events such as the EPT London and World Series of Poker Europe, as well as the WPT Grand Prix de Paris and WPT Alpha8 London. EPT London, which is officially the second event on this season's European Poker Tour schedule, will officially kick off on October 2nd and run until October 12th. The event will be held at Grand Connaught Rooms in Covent Garden. The EPT London main event, which will have a £5,000 + £250; buy-in, will run from October 6th to 12th. Last year's main event, which was won by Ruben Visser for £595,000, ended up attracting a total of 647 players. In addition, the Grand Final of the Pokerstars UK & Ireland Poker Tour will also be taking place during the EPT London festival as well. 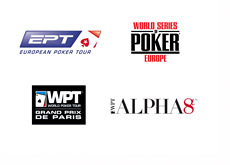 After the EPT London reaches its conclusion, players will travel to Paris to take part in the 2013 World Series of Poker Europe. This year's event will take place at Casino Barriere in Enghien-les-Bains. The 2013 WSOPE will run from October 11th to 25th and features a total of eight bracelet events. The main event, which will run from October 19th to 25th, has a €10,000 + €450 buy-in. Last year's WSOPE main event was won by none other than Phil Hellmuth. Two more events will round out the busy month of October. The WPT Grand Prix de Paris (€7,500 buy-in) runs from October 25th to October 30th and will take place at the Aviation Club de France. In addition, for those high-rollers who are still in London, the second WPT Alpha8 event will be taking place at the Palm Beach Casino in Mayfair, London. The two-day event, which begins on October 28th, will feature a total buy-in of £100,000.